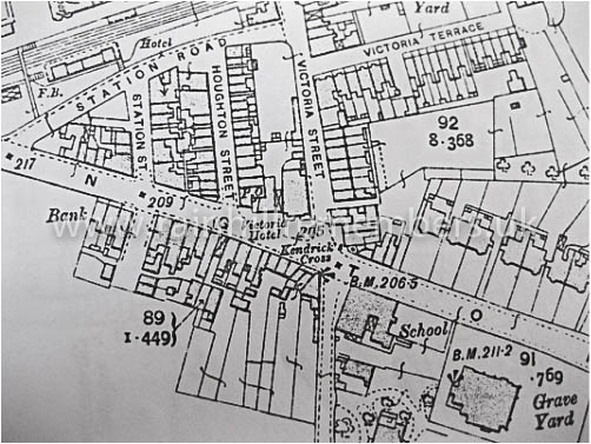 John was born in 1886 and lived in Station Street, Rainhill with his father, Edward. John‘s occupation was given as a boot maker, shoe repairer and saddle repairer in the 1911 Census. He enlisted on 12th January 1916 and was mobilised on 19th April 1916. He received gunshot wounds to his left leg but recovered sufficiently to return to his Unit. In April 1919 he was granted 14 days leave to the UK before returning to his Unit and in July 1919 was granted a further 4 days leave at the British Empire League Club in Cologne. He was demobbed in September 1919. He acknowledged receipt of the British War Medal and the Victory Medal. The map below shows Station Street leading directly from Rainhill Station to Warrington Road. It is likely that John lived in one of the houses on the righthand side.